“…Ready to enter the Indigenous Arts & Stories competition online? Great! The deadline for entry is March 31. The contest is open to Canadians of Indigenous ancestry (self-identified Status, Non-Status, Inuit and Métis) between the ages of 6 and 29. Indigenous Arts & Stories (formerly the Canadian Aboriginal Writing and Arts Challenge) was born in 2005 out of the success of Our Story: Aboriginal Voices on Canada’s Past published by Doubleday Canada in which nine leading Indigenous authors from across the country, including Tantoo Cardinal, Tom King and Drew Hayden Taylor, contributed a short fictional story about a defining moment in Indigenous history. The program quickly became the largest and most recognizable creative writing competition in Canada for Indigenous youth. In 2010, Historica Canada (formerly The Historica-Dominion Institute) announced the expansion of the program into arts, making the competition available to a new audience of Indigenous youth – those who are not writers, but instead express themselves through painting, drawing and photography. We believe that the expanded program gives start to the next generation of both great Indigenous authors and artists. Indigenous Arts & Stories has earned large scale support from the Indigenous arts and literary community, including those that comprise the patrons and advisory committee. More than 3,000 emerging Indigenous writers and artists from every province and territory in Canada have participated in the contest since 2005. “…Prêts pour enregistrer pour Arts et récits autochtones en ligne? Fantastique! “…Arts & récits autochtones (anciennement le Concours de rédaction et d’arts pour autochtones) est né en 2005 du succès de Our Story: Aboriginal Voices on Canada’s Past, publié par DoubleDay Canada. Dans cet ouvrage, neuf grands auteurs autochtones provenant de partout au pays, dont Tantoo Cardinal, Tom King et Drew Hayden Taylor, ont rédigé une nouvelle sur un épisode déterminant de l’histoire autochtone. Depuis lors, le concours est devenu l’épreuve de rédaction la plus importante et la plus identifiable qui soit destinée à la jeunesse autochtone du Canada. Il a obtenu l’appui à grande échelle des membres des milieux artistiques et littéraires autochtones, dont les membres d’honneur et du comité consultatif. Depuis 2005, plus de 3 000 écrivains et artistes autochtones émergents de tous les territoires et les provinces du Canada ont participé au concours. En 2010, Historica Canada (anciennement l’Institut Historica-Dominion) a annoncé l’expansion de ce concours. Cette expansion rend le concours accessible à un nouvel auditoire de jeunes Autochtones : ceux qui, au lieu d’écrire, s’expriment par la peinture, par le dessin et par la photographie. Nous croyons que l’enrichissement du concours donne naissance à une nouvelle génération de grands auteurs et de grands artistes autochtones. Excerpts “… Here’s something you need to know: I’ve learned that Apple has acquired Pop Up Archive, the Oakland-based online platform focused on building tools to transcribe, organize, and search audio files. Among its suite of tools was the podcast search engine Audiosear.ch, which wound down operations on November 28, presumably in the wake of closing the acquisition. Pop Up Archive https://popuparchive.com/ @PopUpArchive http://twitter.com/PopUpArchive was founded in 2012, and has since grown off an extended series of seed investments and grants from sources like Bloomberg Beta, 500 Startups, and the Knight Foundation, among others. The company also has a close relationship with PRX; in 2012, the two organizations partnered up to build Pop Up’s original web-based archive system. Et l’industrie du podcast au Canada et Québec. “.. Notes from North of the Border, Part 3. I’m going to wrap this series up with three quick snapshots of the CBC, Radio-Canada, and a freelance producer working in Toronto. (1) Canadian Broadcasting Corporation. The CBC, of course, plays a considerable role in the country’s budding podcast industry. It functions as the primary provider of jobs, and its various advantages in the space come from the long-established scale, reach, and branding via decades of its legacy in broadcasting. Last month, the CBC welcomed the third season of its true crime podcast, Someone Knows Something, which would go on to drive 2.3 million downloads in the first week. (It should be noted, however, that all six episodes were dropped at once on November 6, a move that’s being deployed more commonly nowadays). I sent over a few questions to get a better sense of how the CBC is thinking about podcasts, and Susan Marjetti, the organization’s executive director of radio and audio, sent back some responses. What is the CBC’s perspective on podcasts? Does it see the medium as part of the digital mix, or is it something that may replace broadcast operations one day? What’s the general opinion at the CBC about opportunities in the media for young Canadians? One of the bigger trends I’ve noticed is talented young Canadians crossing the border a whole lot, and I’m wondering if the CBC is aggressively thinking about that dynamic and how it’s handling that outflow of talent. 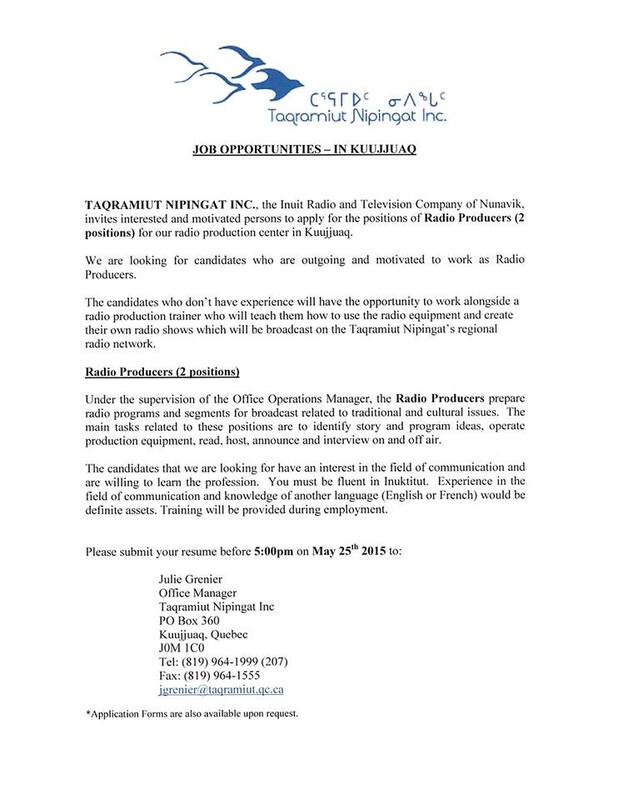 Inuktitut JOB OPPORTUNITIES- IN KUUJUAQ, Nunavik, Quebec: Taqramiut Nipinqat Inc. the Inuit Radio and Television Company of Nunavik, “… invites interested and motivated persons to apply for the positions of Radio Producers (2 positions) for our radio production center in Kuujjuaq. We are looking for candidates who are outgoing and motivated to work as Radio Producers. The candidates who don’t have experience will have the opportunity to work alongside a radio production trainer who will teach them how to use the radio equipment and create their own radio shows which will be broadcast on the Taqramiut Nipingat’s regional radio network. Under the supervision of the Office Operations Manager, the Radio Producers prepare radio programs and segments for broadcast related to traditional and cultural issues. The main tasks related to these positions are to identify story and program ideas, operate production equipment, read, host, announce and interview on and off air. The candidates that we are looking for have an interest in the field of communication and are willing to learn the profession. You must be fluent in Inuktitut. Experience in the field of communication and knowledge of another language (English or French) would be definite assets. Training will be provided during employment. * Application Forms are also available upon request. via The survival of a culture at the brink — Northern Journal. 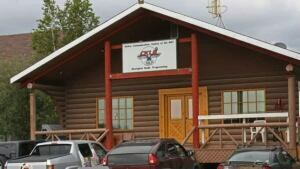 The shutdown of CKLB and the silencing of its Aboriginal language programming is a loss for all Northerners; and if reports that as many as a dozen Aboriginal language radio stations across the country may soon lose the financial means to continue their own programming are true, all Canadians will suffer a loss. 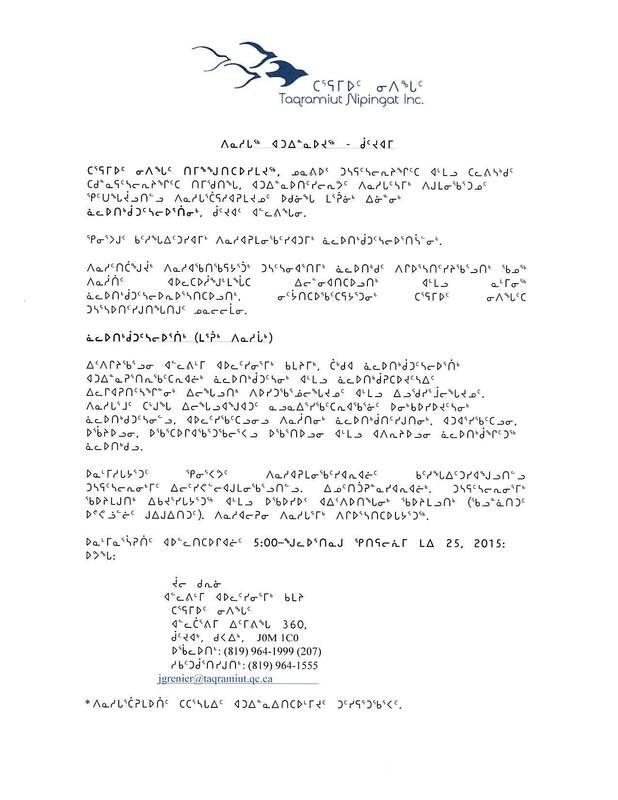 In particular, the termination of CKLB and other radio stations like it is a serious blow to the ongoing efforts to revive Aboriginal language and culture. CKLB is listened to in many Northern communities where Aboriginal languages are still used routinely by elders and the middle-aged, giving youth a chance to learn and carry on their ancestral languages. Taking that away is a great setback. Not supporting the return of Aboriginal languages, while supplanting youth completely within English language instruction in schools – in order to facilitate a more efficient economic model – is as colonial in its way as residential schools were.